Home › Crew Supply Vessel › Fast Crew Supplier › Fast Crew Supplier 2610 › Fast Crew Suppliers 2610 "Seazip I" and "Seazip II"
On the 29 November, 2012, the documents were signed for the handing over of two Fast Crew Supplier 2610s Twin Axe Work Vessels, one to SeaZip 1 Shipping B.V., yard number 532506, and the other to SeaZip 2 Shipping B.V., yard number 532507, in the Netherlands. Both vessels were contracted to Damen Shipyards Gorinchem and were built in cooperation with Damen Shipyards Singapore. The vessels are each equipped with Heila HLM 20-2S deck cranes, two aft anchors and a diver recovery system. 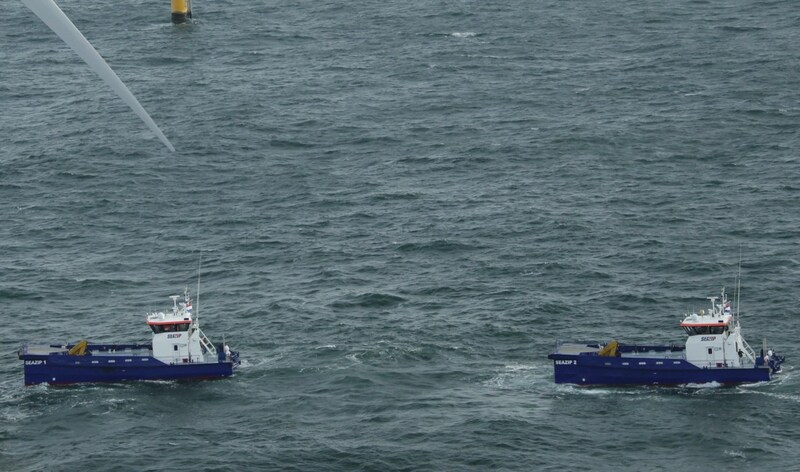 They now operate in the waters of north-west Europe and are used for the transport of maintenance personnel to wind turbines. Their home port is Harlingen, the Netherlands.